Aim: The gracilis muscle is one of the most frequent used free flaps in reconstructive surgery. 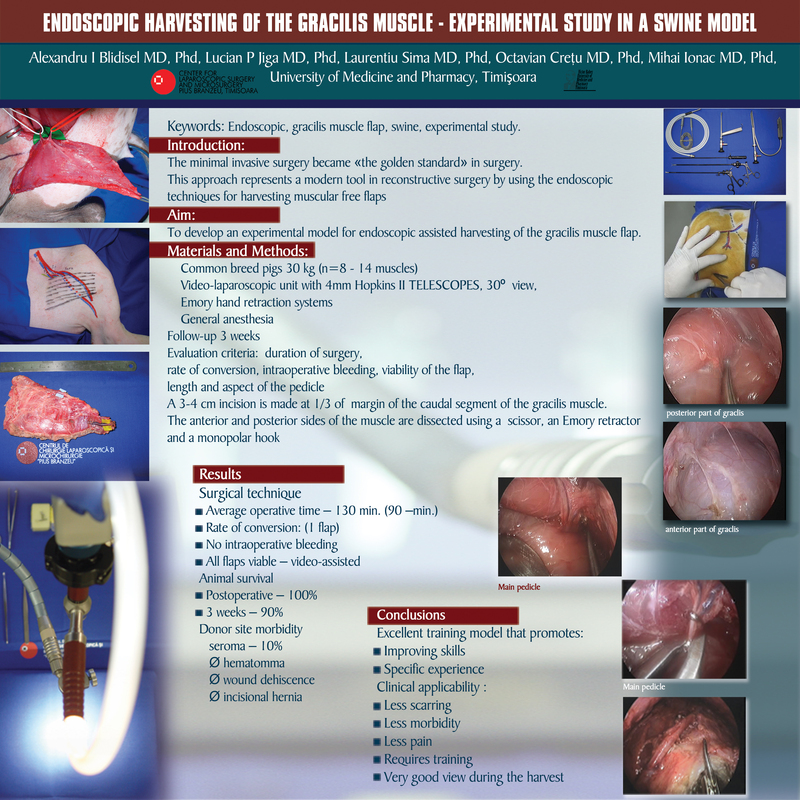 In reconstructive surgery, endoscopic muscle flap harvesting allows a minimal invasive approach of the donor sites, leading to lesser immediate and late post-operative complications, reduced local morbidity and faster healing. The present study aims in establishing the experimental model of this technique in pigs. Material and Method: The study was conducted on 12 pigs with an average weight of 30 kg. After orotracheal intubation and anesthesia a 3-4 cm incision is made where is inferior border of gracilis. Dissection of the anterior and posterior side of the muscle was done under visual control offered by the endoscopic instruments consisting in: Emory optical retractor, Hopkins II 4mm optic telescopes at 30, 35cm Metzenbaum scissors, Hook unipolar coagulator, bipolar scissors 23 cm.. The work chamber is created using Emory retractor. 14 muscles were harvested used the minimal invasive surgery. The pedicles were left intact , for evaluation of the flap. Results: Operating time was between 90 and 140 minutes, with a mean time of 120 minutes. During the study the rate of conversion, bleeding, duration of the surgery, viability of the flap, length and aspect of the pedicle and moment of mobilization were followed. One primary pedicle and two secondary pedicles were damaged during surgery with following seroma development. One experimental animal died 24 hours post-operatory. Conclusions: The endoscopic technique does not involve difficulties while dissecting the vascular pedicle or during the muscle harvesting. Muscle dissection is safe due to rigorous hemostasis, with reduced intra-operatory bleeding and low risk of developing post-operatory hematomas. Minimal post-operatory pain and scarring due to careful and atraumatic endoscopic harvesting technique, lead to an indisputable esthetical advantage and a good functionality of the donor site through limited fibrosis. At the same time, this technique represents an excellent training model for developing endoscopic flap harvesting skills.